The entertainment iPad apps deal with movies, TV, and music, and they include all kinds of fun-to-play with interactive apps. Whether you’re interested in the entertainment industry or just entertaining yourself for a few minutes, iPad has the app for you. The so-called acrobots (or “bots,” for short) are multicolored, gelatinous, acrobatic creatures with circular bodies and three slender arms that have suction cups at the ends. 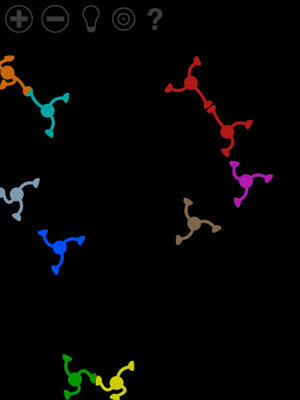 The bots tumble, disconnect, reconnect, push off one another (and the edges of the screen), and float around in a smooth, colorful ballet. The settings screen, shown in this figure, lets you control the physics that govern the bots’ movement. You have complete control over the bots’ size, balance, suction-cup stickiness, and movement speed, as well as the effects of gravity and air drag. The laboriously named Kingdom of the Blue Whale iPad HD from National Geographic (Nat Geo) turns some awesome-looking ocean photography into a jigsaw puzzle. And it turns out that the iPad is a great medium for puzzles! Who knew? Kingdom of the Blue Whale iPad HD comes with 50 photos from Nat Geo’s archives, all of them related to the ocean, and many of them involving whales. You can take those photos and turn them into puzzles, but you can also share them to Facebook, e-mail them, or save them to your photo library for use as wallpaper for your iPad. 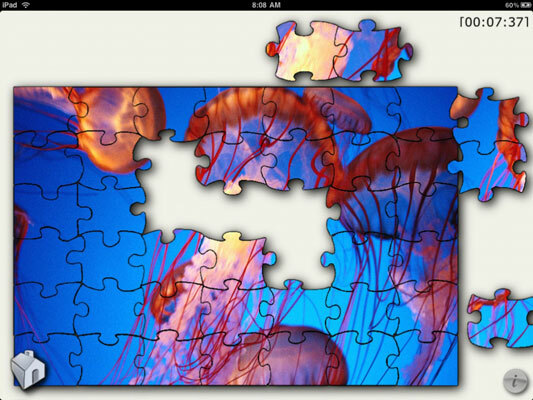 You can also turn any photo in your library into a puzzle. You’ll see a Personal option when you tap New Game that you can use to browse your photo library. And because there are four difficulty levels for each image, even young kids can have fun with this app; adults will enjoy a casual puzzle session. And if you have to stop working on a puzzle, you can pick it up where you left off. Try that with a real puzzle on your kitchen table! 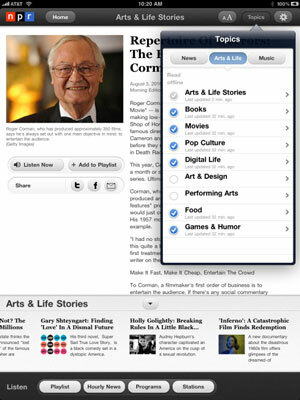 The NPR app delivers some of the best programming that National Public Radio has to offer — directly to your iPad. The app itself is elegant and easy to navigate, as befits a national institution like NPR. But unlike listening to your local NPR radio station, the NPR for iPad app lets you pick and choose what you want to hear (or read), as well as when you want to hear it. One cool feature is the capability to select topics for offline reading. Also, many stories provide you with a choice of text, audio, or both. The playlists are awesome, as is the capability to choose topics you want the app to download automatically for offline reading. The user interface is a delight to both the eyes and the ears. And you can’t beat the price (free). Do you have more movies than storage space on your iPad? Air Video solves the problem by making the video storage capacity of your devices limitless. Just install the free Air Video Server app on your PC or Mac, and specify the folder(s) to contain the video you want to watch on your device. That’s all there is to it! And unlike iTunes, Air Video Server supports almost all video formats — and can convert most video on the fly, so there’s no waiting to watch what you’ve chosen. IMDb is the Internet Movie Database, which is probably the world’s largest collection of information about movies, actors, directors, TV shows, and much more. It also provides movie showtimes for local theaters, TV listings for your local time zone, recaps of yesterday’s TV shows, movie trailers, reviews, and much more. Picture a beautiful, crystal-clear pond with colorful koi swimming in its shallow water, with the soft sounds of nature in the background. Next, imagine sticking a finger in the water and watching the water ripple as the koi dart away. Now picture what this scenario might be like on your iPad and you have Koi Pond HD. It comes with a variety of calming themes plus a pond editor to create your own watery wonderlands (paid version only). The app is free, but the Netflix membership isn’t. The Netflix app lets you stream thousands of Netflix movies and TV shows to your iPad. If you’re not a Netflix member, the service is definitely worth checking out. If you are already a Netflix member, download this app immediately (if you haven’t already). Touch the screen with any number of fingers from 1 to 10 and watch what happens to the multicolored dots and lines.